Look up! The sky really is falling. Every chemtrail drops elemental residue and launches airborne metallic particles that rise up into the higher atmospheres. The National Weather Service let that slip recently. There are three parts to this effort: 1) heavy metal poisons drop down on humans as an experiment, 2) sun-blocking metallic flakes warm the earth to help the official agenda of climate change, and 3) metallic aerosols that are lighter than air rise up into the atmosphere. All three strategies were secret, but have been disclosed in reliable independent news sources. Most amateur chemtrail researchers, like myself, know the first two effects of spraying the atmosphere, but you have to dig a little deeper into your individual research to figure out the third which has many sinister aspects. When you combine the HAARP antennae array with its powerful broadcasting station that can broadcast virtually any frequency from extremely low to microwave and beyond, you can light up the metallic flakes in the atmosphere with broadcast waves of many types. Do you own research and you will discover that HAARP has the capacity to project holographic images and EEG brain-scan images as “narrative networks” directly into the human skull through transcranial direct induction. Other “brain images and sounds” can be wirelessly broadcast by the cell tower network that covers America. Recent research funded by DARPA and In-Q-Tel (NSA and CIA) on narrative networks demonstrates that these systems are already fully functional in the Department of Defense. And guess what our government, using our tax money, found out to be the most powerful ability to shape perception management? Religious and sacred imagery and stories. Project Blue Beam suggests that HAARP will soon project the second coming of Jesus onto this chemtrail silver screen. Others add that Jesus will show up in an alien space-craft at the Pope’s observatory at Mount Graham, Arizona. The Pope has already said aliens have contacted the Vatican in the past and he expects that they will contact him soon. He also has said that he will baptize them if they so choose. This belief is well known and common in the Catholic Church today. It is my belief that the Pope is not planning a rapture-like coming of Christ “in the clouds,” but one that is filled with aliens and space-craft from other worlds. A close look at spiritual development over the past 4,000 years reveals numerous spiritual people who did ‘”look to the skies” and something really did descend. Ezekiel saw the spinning wheel; Elijah saw a fiery chariot; Enoch walked up into heaven; Jesus Christ ascended; Mary Sophia was assumed into heaven and the list goes on. In Buddhism, the fiery goddesses Vajrayogini takes you by the hand and pulls you up into heaven. Hercules was raised into the starry script like many Greek heroes and heroines. And Christians around the world are awaiting to experience New Jerusalem descending from heaven. These images are powerful narratives that make extremely developed neural network pathways that merge all parts of the brain. These narrative networks can override all other brain patterns and have a “magical” effect upon the person stimulating these parts of the brain. Research has isolated the patterns of narrative networks by taking many MRI’s of the brain as the concepts of religious ideas are suggested to a patient. The images that arise are similar no matter what language is being spoken. Earlier research found that letters and words could be directly “sounded” into the heads of patients, but that projecting narrative networks carried thousands of subsidiary connections that simple words do not. Narrative networks are like a symbols that carry an entire fable inside of it. Once a narrative network is established, it is hard to override and it deeply effects the moral, religious, or spiritual core of a person. Did you know that the US military (HAARP, DoD, and the alphabet agencies) has been studying brain patterns and religious narratives? Keep in mind that HAARP is a DoD project, under the control of the Broadcasting Board of Governors, because HAARP “broadcasts.” What a great way to have “ divine superiority” over the masses, using sophisticated broadcasting devices to project images of religious and sacred imagery that already have narrative networks engrained in us. Is HAARP getting ready to project a World Wide apparition of the Holy Mother? Yes, indeed. Why? Because the evil ruler of earth, Ahriman, has incarnated and wants to make machines do what the spiritual nature of humans should do – transform humans from animals into angels. Ahriman is a fallen angel who wishes to lead humans to believe there is only matter and no spirit. When Ahriman (working through the machinations developed by the military) projects a world-wide apparition of the most beloved of all religious figures into the sky above each region of the earth through HAARP and sends a message – most materialistic humans are going to believe that message – no matter what it is. Of course, the likely message is – here is my beloved son (pointing to some earth leader) in whom you should believe. Ahriman, being aware of certain military “secrets,” could share these secrets as proof of his superiority over humans. Then, of course, the same tired ideas found in good sci-fi movies will transpire. Lay down all weapons, join in one world religion inspired by the alien (Ahriman) and the Pope, and unite in one world economy and governance – aided by the superior intelligence of the aliens. All aliens are really smart aren’t they? Why will this ruse work on many people? Not only because of the power of the military’s weapons, but also because it is true. 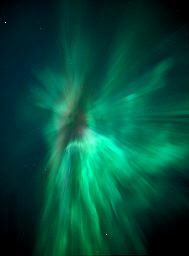 The Holy Mother does appear to people, usually just above them – in the sky (air). 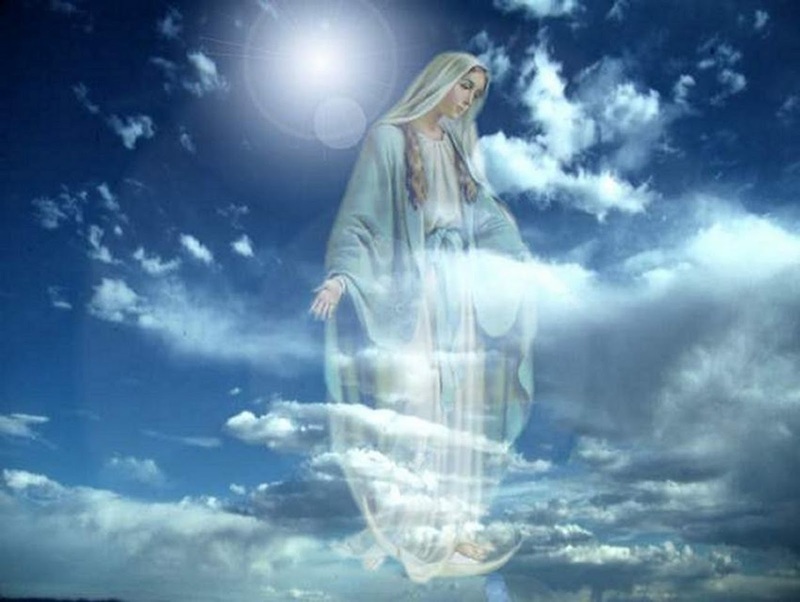 The Holy Mother has never stopped appearing in apparitions, visitations, healings, and personal manifestations to people all over the earth, no matter what religion or creed. Everyone has a mother from which they came. Everyone wants to return to the heavenly home – somewhere out there. The longing is universal and carries some of the most powerful forces of the soul. Visionaries and apparitionists often throw their heads back just as the vision begins and hold it there throughout. Angels are often seen “above” the ones who see them. At many apparition sites, the sun begins to swirl and many witness this event and “believe.” At Medjugorje the word MIR (peace) appeared to the troops who were in pitched battle all around the town. Each soldier saw the letters in the right direction no matter where they witnessed it. Will you be able to tell the difference between the real Holy Mother and a HAARP holographic image of Her or an alien Mothership? Each person can now experience Sophia, the Holy Mother, directly and personally. The Mother has never left our side as I write in The Gospel of Sophia: The Biographies of the Divine Feminine Trinity. She is the mid-wife of our spiritual development. That is why, I believe, that She will be chosen as the universal image or icon of sacredness in an Ahrimanic ruse. She actually is present everywhere on the earth and does appear to the faithful. The stories of Mary apparitions circle the globe, in every culture and in all ages. Her image would be perfect for a BBG production. And where folks may be too secular to have a religious network narrative, a large UFO Mothership will suffice as the image in the sky. We should all be watching the spiritual sky of our own spirit to mount that sky with soul-wings that carry us to the top of the mountain where we truly will meet the Mothership – the New Jerusalem, Shamballa, Tushita Heaven. We will all meet that fiery chariot as we cross the threshold between the physical world and the spiritual world. It has been described by many who have gone before us and predominates myths, legends, religions, mystery religions, secret societies and by clairvoyants. Sophia is here now and can be seen in the interaction of the solar wind and natural ionization of basic articles of carbon, nitrogen, oxygen and hydrogen that we call the aurora borealis. The magnetosphere that protects the earth from the harmful rays of the sun is the “cloak of Sophia” that allows only the good gifts of the sun to come into the surface of the earth. Scientists are trying to understand this Sun-Earth relationship and they have only scratched the surface. HAARP has launched many missiles into the atmosphere to explode aerosol metallic particles that are then irradiated with experimental frequencies that can light up the atmosphere like the aurora borealis or create holographs and narrative network brain-patterns. HAARP can already project giant holographs into the high atmosphere on the reflective surface of the chemtrail aerosols, as well as use a whole encyclopedia of frequencies that can create health or illness. So whether you want to see the Holy Mother in your own aura through spiritual development or in the sky when HAARP projects it – the outcome is up to you. Materialism will simply bind you to the Earth whereas bonding with Sophia will raise you up. Yes, into the sky. In six thousand years from now, only a few incarnations, we will either rise up into the sky to meet our older brothers and sisters descending to meet us or we will be horribly bound to the dying earth. Don’t be alarmed when the United Nations wants to rule us in a new world order with a global religion once the Pope meets up with the alien ships. Notice that he and his fellow Jesuits at Mt. Graham keep telling us about the approaching aliens, not about an approaching Mary-Sophia. The all-male order probably can’t conceive the idea that a divine feminine such as the Holy Sophia, could be the ultimate Creatrix of our Universe. It is She who is truly approaching us, but a materialist, Jesuit or otherwise, can only see the limits of his own perception. The outer often looks like a mirror image of the inner. Just as Lemuria was destroyed by fire and Atlantis was destroyed by water, our age will be destroyed through the air. The battle of the human soul is in the air. We look up and long for the future because that is where our future is. The time of decision is now and the battle always heats up just before the victory. We can choose to be passive, lazy souls who watch mindless television programming, YouTube, Facebook groups, or our phones. And now for the ultimate BBG production – HARP skywriting bringing us what we have been too lazy to work towards ourselves, “proof” of the spiritual world, life after death, and immortality. Ahriman will give us a fake spiritual world filled with aliens, advanced technology and distant galaxies. He will tell us that the Holy Mother, whether as an image of Mary or an alien Mothership, is his mother and she sent him to help us. Ahriman will promise eternal life in a physical body through technology that will, in fact, bind the soul to the earth and not allow it to soar into the spiritual world. Ahriman will fill his followers with lies and give them personal clairvoyance that is actually false and will produce chaos and despair through spiritual materialism. Sophia is the most powerful icon of our times. She is coming to us “from the clouds” through our etheric bodies that can perceive the living nature of the earth and its harmonious connection to all aspects of the human being. Sophia will place each individual in the center of the universe and there will be no need to travel in space ships to other planets. We will simply levitate, with a much higher vibration of our physical bodies, into the atmosphere in biospheres that can synthesize sunlight into the nourishment that humans need. In the future, humans will draw nourishment from the atmosphere and the ultraviolet and gamma rays that harm us now will feed new organs that are being developed through moral development. Moral and spiritual develop causes DNA to mutate into the new forms humans will become – angels. 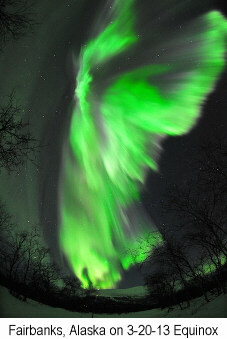 Indeed, someday we will ‘get our wings’ in a somewhat literal fashion. But it won’t be accomplished by believing the lies of Ahriman who will want us to believe that a projected image upon the atmosphere is Christ Returned. Indeed, this is not the Second Coming of Christ, but what one might call the anti-Christ. The internet has been seeded with stories, blogs, and articles about Revelation, apocalypse, the return of Christ, the end times, judgment day, Shemitah, alien ships, and extraterrestrials. The government has softened up the masses, letting us run wild on the internet that they control with our doomsday scenarios and religious anticipations, all of which have reinforced the network narratives that will properly prepare us to witness the BIG BBG movie in the sky and then to do their bidding…whatever that may be. I can’t tell you what might be projected on our metallic laden atmosphere. It could be a holographic spacecraft over every city, using drones as the projection instruments. Or it could be a religious image of Mary-Sophia, or of the Christ. I just wanted to point out to you that the technology for this Orwellian scenario is available, and we have a determined government with a hidden agenda that doesn’t seem too friendly.